BRYAN EATON/Staff photo. 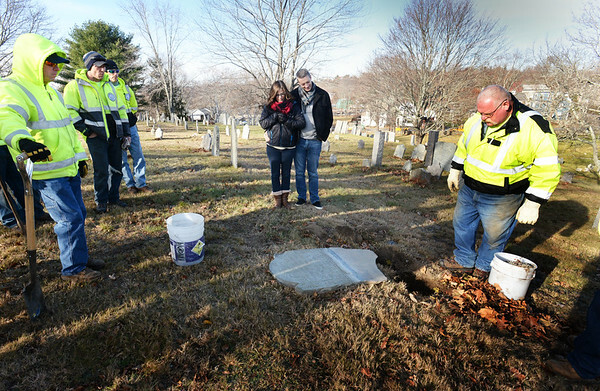 Bob and Lore Switzer of Pepperell approach the gravestone of Lydia Smith, who died in 1745, with members of the Newburyport Department of Public Services, with foreman Alan Frost, right, at the Old Hill Burying Ground. They found the front portion of the stone at their Pepperell home and traced it to Newburyport and returned it to officials. Frost found the backing of the stone through records, pieced it together and replaced the stone yesterday on the 272nd anniversary of Smith's death.